The Acrobats from "The Transformation Series" – Developed over a period of 12 years, producing over 400 pieces. 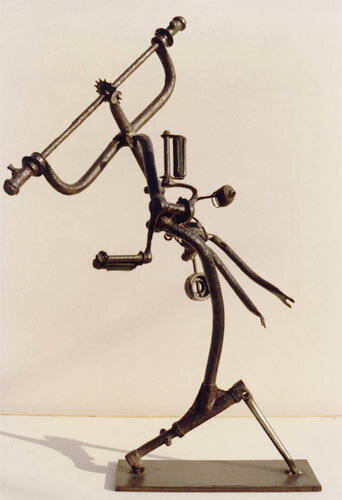 Many of the works were used in the "Discoveries in Sculpture" program, that focused primarily, (although not exclusively) on engaging the imaginative faculties of children ages 6 - 12 years when the child is actively playing with, and processing the world while concomitantly being actively reinforced and conditioned by it. old child's tricycle buried in the sand, rearranged, axle added, 36"